An important issue that new internet entrepreneurs should address prior to setting up their online businesses is the question of an appropriate web platform. What type of website do you need to build, and what kind of content should you post to attract your ideal customer? Among the options at your disposal include the services of a website builder. Website builders take the drudgery and hassle out of website creation by offering “point and click” solutions. A far cry from the early days of the World Wide Web (WWW), when dedicated coders had to use HTML, Flash or some crazy computer language to put up a webpage. Web.com is one of the most established services available, offering a potpourri of e-commerce tools that are more than adequate for getting even the most technophobic among us up and running fast. The Pros: Features and Benefits. A quick three-step sign-up process that lets you choose your own domain name, pick out a customized website design for your business/hobby, and publish it instantaneously on the Internet. All it takes to get started is a telephone call or a live chat. Web.com’s easy to use website building tool (SiteBuilder) with hundreds of starter design templates that aim to enhance your online presence. Access to a vast stock image library that allows you to make your website more relevant and enticing to your customers. Design enhancement capability including multimedia, i.e. sound, music, Flash animation and video. The ability to drag and drop widgets like: date and time stamps, roadmaps, visit counters, guest books, and other helpful items on your website. If you wish, Web.com designers can build you a customized e-commerce site that can completely knock your socks off! If you are not a hands-on techie, the editing software and premium back office gives you access to tools that put it in a class of its own. Web.com sponsors regular small business summits throughout the United States and Canada, a testimony to its three million person customer base and three decades of experience. On the surface, a website builder seems like the logical way for “newbies” to announce their arrival on the Internet. 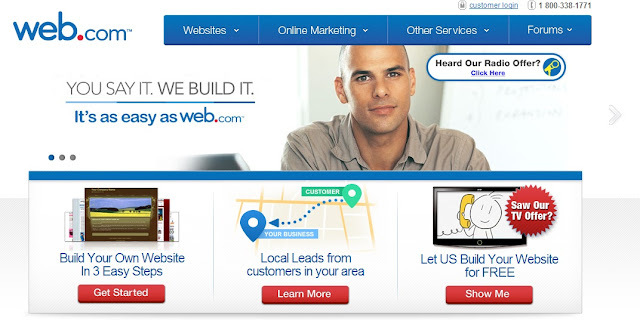 Web.com is a decent product, arguably the best website builder available today. However, by using Web.com to create your platform, you surrender a big chunk of your business independence. Your creativity will be limited to Web.com’s library of templates, skins, and other features. Web.com designers can make great websites, no doubt about it. However, yesterday’s model will have to be maintained, upgraded and adapted to new market conditions, and pre-fabricated creations have a habit of burning through your operating cash flow very quickly. It remains somewhat lacking in marketing tools, especially when it comes to loyalty programs and enhancing your Facebook and social media marketing presence. Web.com’s basic e-commerce package only allows twenty products with about 1 Gigabyte of storage. Therefore, your scalability might be limited to comparable software packages that offer more. In addition, Web.com charges for every transaction which can really add up regardless of what stage your business is at. Its fees for eCommerce services are among the highest for its business category. You have no choice but to buy the most expensive software version to be able to sell downloads. As Web.com looks to upsell you towards more enhanced e-commerce packages, it departs the role of website builder and becomes just another web host. Benefits like e-mail accounts, e-mail storage, and unlimited web storage are standard elements of a decent web hosting package from most reputable companies offering the service. Chances are that you can find better pricing outside Web.com, since traditional web hosting companies survive in large part based on price competitiveness (and customer service, of course!). With a minimum package price of thirty-five (35) dollars USD, Web.com may be worth a peek for people who really want to minimize their face time with the technical details of e-commerce. In the short term, these template-based sites are probably easier and less expensive than other options (like WordPress or customized sites) but only up to a point. They are limited in options; and you're "stuck" with them once your business moves beyond its initial stages. Your eventual transfer from a builder like Web.com to regular hosting where you call all the shots may not be as smooth as you would like.